Description of decorations: Medium sized whole shells of mollusks with colonies of barnacles. Substrate is red shell gravel, consisting of bits of fragmented shells, and whole small shells. The grounds captured with grab for sediment sampling in the North of Caspian Sea during All-Caspian International Expedition in 2017. Facts on aquarium: The fish, crustaceans and plants captured in a trawl during sea expeditions in 2017-2018, in the freshwater/brackish part of Caspian Sea. 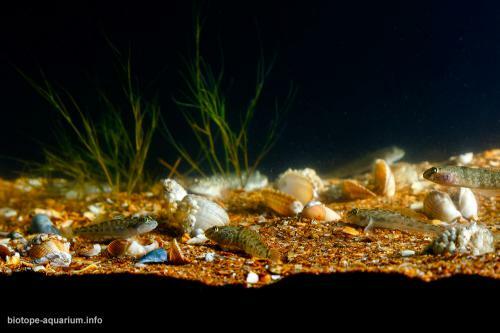 The tadpole gobies and sand gobies can burrow into the ground, hiding from the threat. Due to the lack of zooplankton in the aquarium, the barnacle colonies should be transferred to a separate reservoir with zooplankton several times a week. 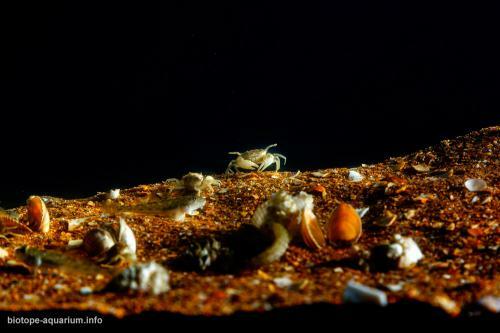 During moult, crabs are hiding in the ground, or in shells of mollusks. 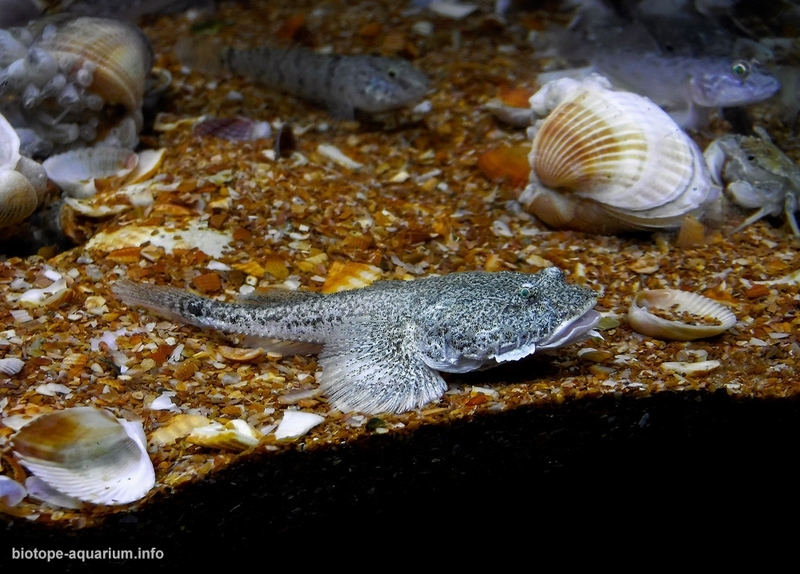 The predators, such as tadpole gobies, should be kept with similar size fishes/not smaller than 1/2 of the predator’s length. Invasive Rhithropanopeus harrisii is included since nowdays it has spread widely in the Caspian Sea to depths of 15 meters. Description of equipment: ASAP 300 internal filter, Leddy tube sunny 8 W/6 500 К. Water parameters: Temperature is 24-26°C; pH is 7.9. The flow is moderate. Description of the area surrounding the biotope: The Caspian Sea is the largest enclosed inland body of water on Earth by area, variously classed as the world’s largest lake or a full-fledged sea. The sea has a surface area of 371,000 km2 (143,200 sq mi) and a volume of 78,200 km3 (18,800 cu mi). The relief of the northern part of the Caspian Sea is a shallow undulating plain with banks and furrows. The Caspian Sea, near confluence of Kigach River (a distributary of Volga River) in Kazakhstan is a freshwater/brackish shallow area with a continental climate. The average depth is about 1 – 1,5 meter. Sedentary fishes represented by numerous species of gobies. Coordinates 46.195992, 49.556129. Description of the underwater landscape of the biotope: Bottom in the North of Caspian Sea is typically flat, without of stones, rocks, driftwood or other big structures. Sometimes an anthropogenic garbage could be find (plastic, bottles, car tires, abandoned gillnets etc.). Aquatic plants are not numerous. Description pf grounds. 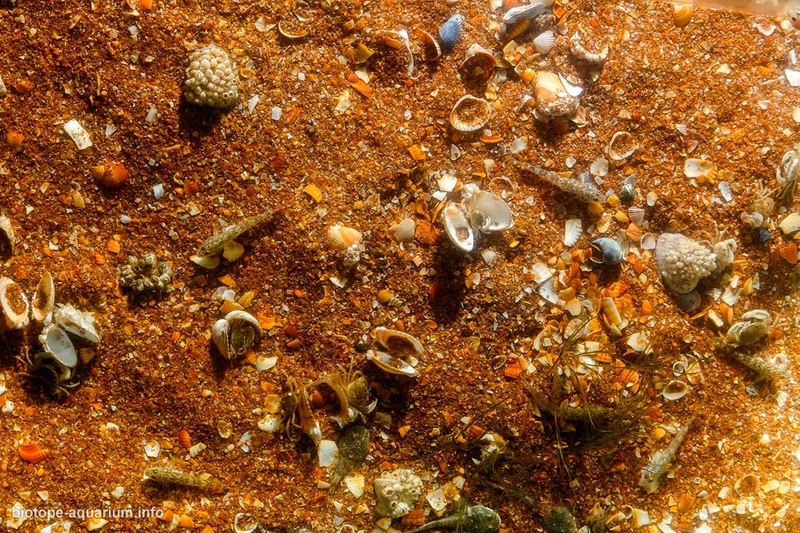 Broken and crushed shells with sand*/silt; whole red shells, silt, or yellow sand on top, red sand mixed with fine-broken and crushed shells, whole white shells. 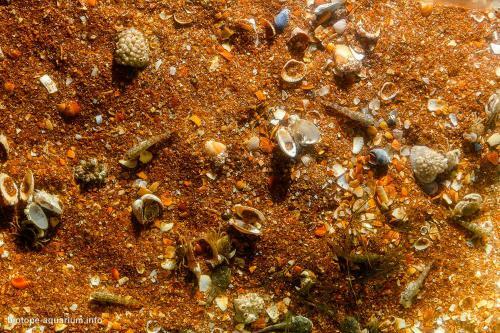 *Sand is consists of small fractions of shells (Didacna trigonoides, Cerastoderma lamarcki etc). Description of the parameters of the habitat: Water clarity in the area is poor (transparency is typically 0,5 – 1,8 meters; up to 4 meters in wintertime). The temperature during the year is between 2-28°C/35-82 °F; summertime: 24-28°C/75-82°F. The average temperature in summer about 25,5°C/78°F. PH is ranging between 7.5 – 8.4. Salinity is 0,1 – 0,2‰. List of fishes and invertebrates occurring in the nature biotope: List of fishes: Atherina boyeri caspia, Benthophilus macrocephalus, Neogobius pallasi, Proterorhinus nasalis, Syngnathus nigrolineatus caspius etc. 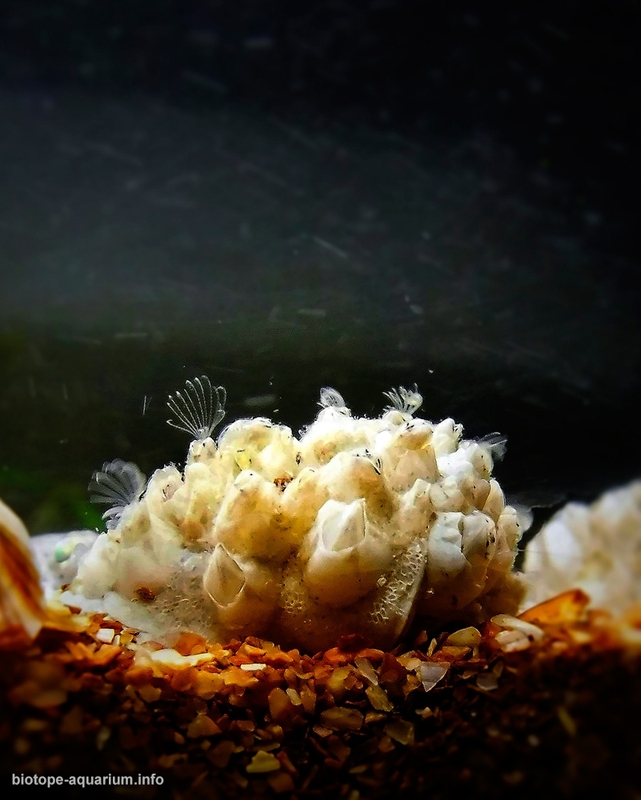 Crustaceans: Amphibalanus improvises, Paramysis baeri, Rhithropanopeus harrisii etc. List of plants found in the nature biotope: Myriophýllum spicátum, Potamogeton pectinatus, P. perfoliatus etc. Threats to the ecology: One of the biggest threats to the ecology are oil and gas industry, highly developed in the region. Lower reaches of Volga River are heavily developed with numerous unregulated releases of chemical and biological pollutants. The other problem is invasive species, causing damage to the environment of Caspian Sea (mainly, transport of non-native aquatic species is happens with ballast water of cargo ships). 1. 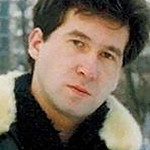 Гвоздев Е.В., Митрофанов В.П. Рыбы Казахстана: Вьюновые, Сомовые, Атериновые, Тресковые, Колюшковые, Игловые, Окуневые, Бычковые, Керчаковые. Том 4. Наука. – 1989. 2. Дукравец Г. M., Mамилов Н. Ш., Mитрофанов И. В. Аннотированный список рыбообразных и рыб Республики Казахстан. Сообщение 2. Семейства Чукучановые, Балиторовые, Вьюновые, Сомовые, Адрианихтовые, Пецилиевые, Атериновые, Налимовые, Колюшковые, Игловые, Кефалевые, Окуневые, Головешковые, Бычковые, Змееголовые, Керчаковые, Камбаловые // Известия НАН РК, сер. биол. и мед. – 2010. – № 4 (280). – С. 18-28. 3. Казанчеев Е.Н. Рыбы Каспийского моря. – M.: Лёгкая и пищевая промышленность. – 1981. – 240 с. 4. Boldyrev V.S., Bogutskaya N.G. Revision of the tadpole-gobies of the genus Benthophilus (Teleostei: Gobiidae) // Ichthyol. Explor. Freshwaters. – 2007. – V. 18. № 1. Р. 31-96. Despite the simplicity of design, the biotope looks very realistic. Many times I have seen such things in the coastal zone of the Caspian and Black Seas on wild sandy beaches. Again I wanted to dive in such places. Nostalgia.